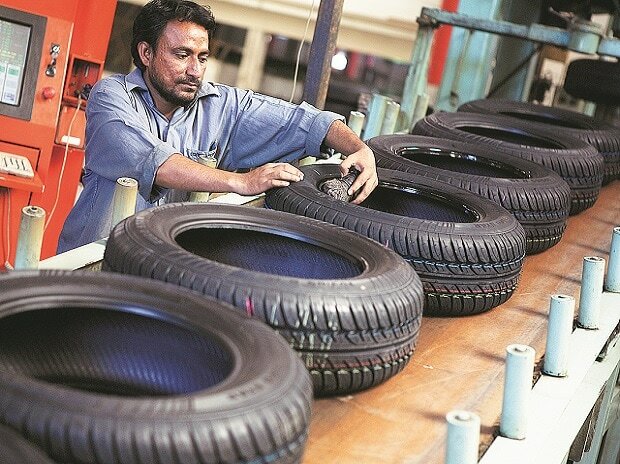 Shares of tyre companies such as J&K Tyre, MRF, Apollo Tyres, and TVS Srichakra etc rallid up to 11% follwoing news reports that the goverment has imposed the anti-dumping duty on import of certain type of radial tyres used in buses and trucks. The decision has been taken to protect the domestic manufacturers from below-cost shipments from China for five years. Reacting to the developmnet, JK Tyre gained as much as 11.7% to Rs 165. TVS Srichakra, MRF, Apollo Tyres, PTL Enterprises and Ceat added anywhere between 1% to 3%. The anti-dumping duty has been imposed in the range of USD 245.35 - 452.33 per tonne, said a notification issued by the Central Board Excise and Customs (CBEC). The duty has been slapped on "new/unused pneumatic radial tyres with or without tubes and/or flap of rubber (including tubeless tyres) having nominal rim dia code above 16 (inch)" used in buses and lorries/trucks. The levy follows recommendation for the same by Directorate General of Anti-dumping and Allied Duties (DGAD). Earlier, Automotive Tyre Manufacturers' Association (ATMA) had filed an application on behalf of the domestic producers -- Apollo Tyres, J K Tyre Industries and Ceat, had approached DGAD for investigations in dumping of tyres. In its recommendation, the DGAD had said the domestic industry has suffered material injury on account of the imports from China. It found that the tyres have been exported to India from the subject country "below normal value".